In the Hawaiian legislature of 1878, Walter Murray Gibson, then a freshman member from Lāhainā, Maui, proposed a monument to the centennial of Hawaii’s “discovery” by Captain James Cook. The legislature approved and he chaired the monument committee. Most of the legislators favored the front of Aliʻiolani Hale (the present Judiciary Building) and this site was approved. After Gibson had talked with artists in New York City and Boston; he made an agreement with Thomas R. Gould, a well-known Boston sculptor who used photographs of models and reviewed Hawaiian artifacts in local museums in his design. This was not a portrait statue, the article went on, but Gould had modeled the features after an engraved portrait of Kamehameha. 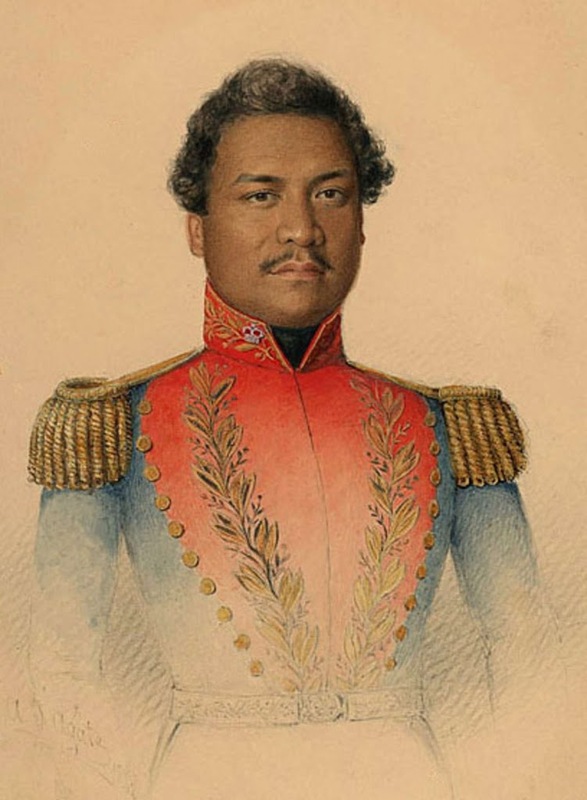 About the time it was lost, King Kalākaua was on a royal tour of the island of Hawai‘i. 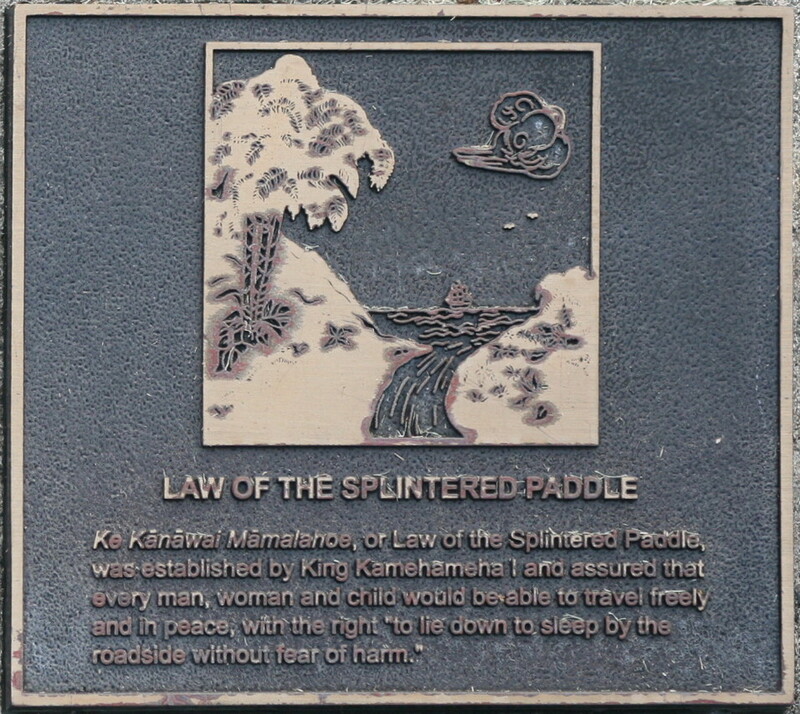 He made a speech in front of the Kohala Post Office. It turns out, however, that the original statue had been recovered and was in fair condition. The right hand was broken off near the wrist, the spear was broken and the feather cape had a hole in it. It was taken to a shed at Aliʻiolani Hale to be repaired. Meanwhile, on January 31, 1883, the replica ordered by Kohala tablets and a forearm for the damaged original statue arrived. On February 14, 1883, the replica statue was unveiled at Aliʻiolani Hale during the coronation ceremonies for King Kalākaua. As for the original statue (which had been repaired,) it was dedicated on May 8, 1883 (the anniversary of Kamehameha’s death – 193-years ago, today) and is in Kapaʻau, North Kohala outside Kohala’s community/senior center. So, the original statue actually ended up in Kohala, where the residents felt it rightfully belonged. 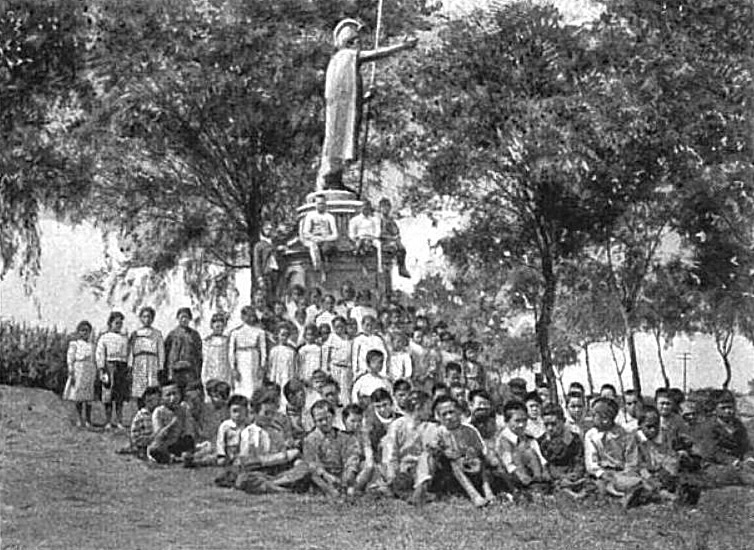 The image shows the original (repaired) statue in Kapaʻau in 1908. 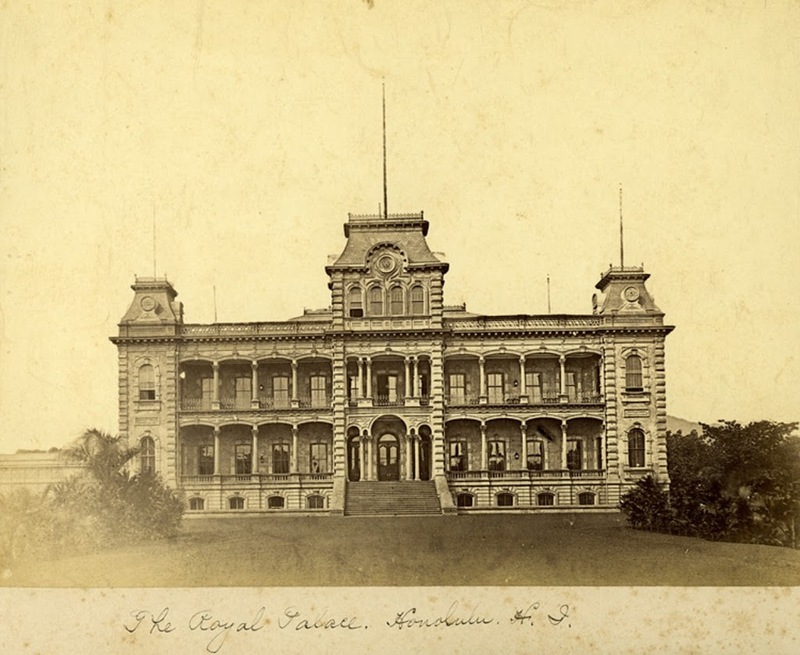 I have posted a number of images of some of the former Royal Residences in Hawai‘i. This is not a complete listing, nor full set of images of these palaces, retreats and residences of Hawaiian royalty. This is a summary list of representative images to share with others. 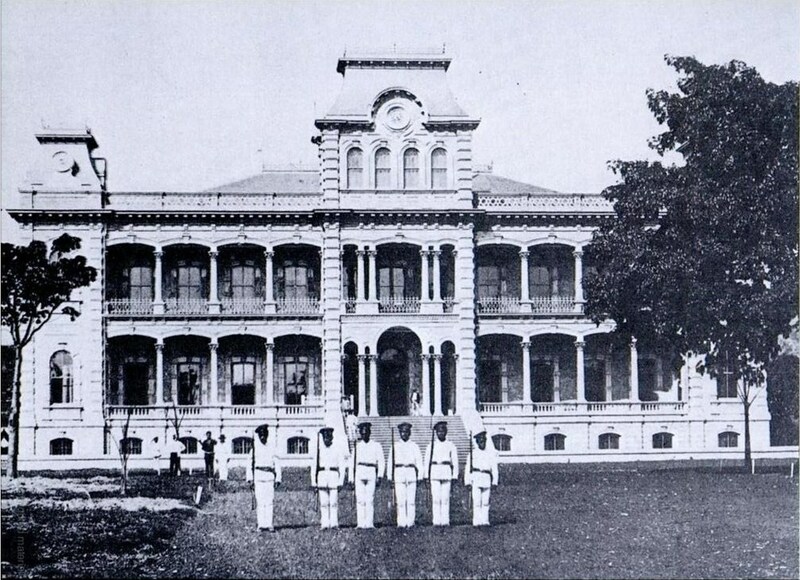 The Iolani Palace was built in 1882 by King David Kalakaua. His successor, Queen Liliuokalani, lived there until she was deposed in 1893. The building was used as the capitol of the state of Hawaii until 1969, when it was restored and turned into a museum and state historic monument. The Hulihee Palace was built by Governor John Adams Kuakini in 1838, and until 1916 is was a vacation home for Hawaiian royalty. It is located on Ali‘i Drive in Kailua-Kona on the Big island of Hawaii. This home summer home of Queen Emma was called “Hanaiakamalama”. You can still see it today, just off the Honolulu end of the Pali Highway. This home in the historic capital district of Honolulu was built by John Dominis and when his son (another John Dominis) married the future Queen Liliʻuokalani it was their home. For many years it was used as the Governor’s mansion of Hawaii but today it is a museum that can be toured by the public. Ainahau was the name of the country home built on Waikiki land that was given to Princess Kaiulani when she was born. Ainahau was built by Archibald Cleghorn for Princess Likelike and his daughter Princess Kaiulani. At first it was a country home but eventually it became their full-time home. Ainahau was eventually sold to land investors and it was torn down in 1955 to make room for the Princess Kaiulani Hotel. Keoua Hale was the palace of Princess Ruth Ke’elikōlani at 1302 Queen Emma Street in downtown Honolulu, Hawai’i. It was larger than Iolani Palace. The Royal complex at Moku`ula was Lahaina’s “Sacred Island” situated in the middle of the 14 acre Mokuhinia Pond. Located across the street from the ocan and 505 Front Street Shopping Center (near the intersection with Shaw Street), Moku`ula was both the sacred place for the seat of government and a sanctuary for the Hawaiian Royal families. Kaniakapupu (“the singing of the land shells”) is the now dilapidated summer palace of King Kamehameha III and his queen Kalama in upper Nu‘uanu, O‘ahu.